I look forward to the day when Naomi begins to play make-believe and wants to start hosting tea parties for her dolls and stuffed animals. In a way, I imagine these times will be full of color, chatter, and a sense of friendship, with a table set with flowers, an old and maybe chipped tea set, and some of the embroidered linens from my collection. The first of three, inspired as the fictitious centerpieces of a table set for tea with friends. 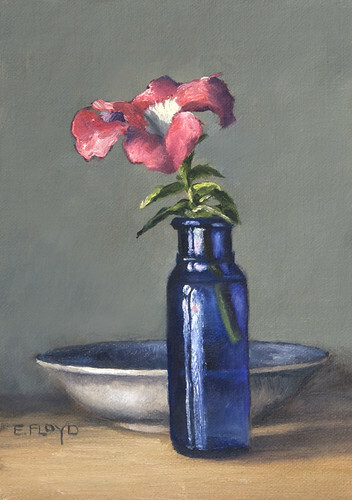 This painting began when the DC region was experiencing warm and sunny days, so much so that my petunias were thriving! They were so beautiful, they deserved to be the focus of more paintings before the first frost occured. I was drawn to their varying pinks and how they paired with the colorful and whimsical vases and bowls I have from the store Anthropologie. Anthropologie has the wonderful aesthetic of combining vintage one-of-a-kind items with a colorful and hip feeling. I just love going into their store and browsing, inspiration abounds, especially in the house goods section! Have you ever started a project, and once you were in the middle of it you realized it would require a LOT more time to complete? This happened to me last week when I began to work on the next painting in the Bountiful Observations series. 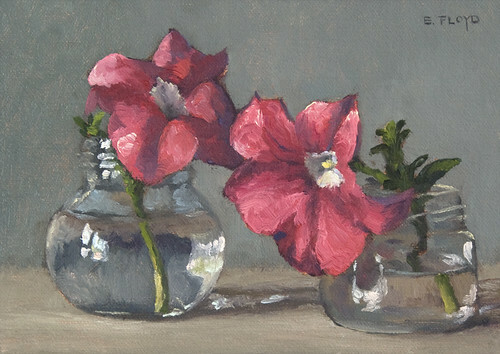 The DC region has been having such warm weather that my petunias have just been fantastic, and I wanted to paint them before a freeze occurs and kills them off. So instead of setting up one composition for a single painting, I was inspired to create three setups. All coordinated around three vases and some bowls I have from the cool shop, Anthropologie. The first two paintings of the triptych are in different stages, somewhat near completion but not quite. And the third painting has been blocked in but I am still not satisfied, so will probably tweak it some more as this week progresses. It is raining here in the DC region, good for the flowers! Last month one of my birthday gifts from S. was the removal of a dying juniper that took up almost half of the flower bed that boarders our driveway. Now that it is gone I have been able to fill in the space with a lilac bush and other annuals, including the petunias in this painting.